1712 records – page 1 of 35. The file consists of the 1948 by-laws, with amendments passed in 1949 and 1950. Office copy signed by Geo. E. Church and Eileen Birch. The file contains the By-laws as revised in 1958, 1961, and 1963. Act of incorporation and by-laws – 1966-1975. The file consists of the text of The United Farmers of Alberta Co-operative Limited Act, 1966 together with the by-laws, as revised in 1963, 1970, and 1975. The 1975 version is an office copy, annotated and corrected by means of an insert. Act of incorporation and by-laws – 1978-1987. The file consists of the text of The United Farmers of Alberta Co-operative Limited Act, 1966 together with the By-laws as revised in 1978, 1983, and 1987. Act of incorporation, by-laws – 1992 - 1994. The file consists of The United Farmers of Alberta Co-operative Limited Act, 1966, together with the By-laws as revised in 1992 and 1994. The file contains three editions of a folder with removable cards containing reference information for Delegates and other leaders speaking on UFA Co-op history and organization (1962, 1963, 1965). The 1962 cards were transferred from the Milt Ward fonds, donated by Jack Ward. 1963 annual meeting : report of Trading Policy Study Committee to the Annual Meeting – 1963. The file consists of a report by a committee struck to study retail credit policies. President Jake Frey was chair of the committee. 1964 annual meeting: address of President George Sayle – 1964. The file consists of a report to the Annual Convention on the achievements and prospects of UFA Co-op. Correspondence regarding Junior F.U.A. leadership course – 1951. 1959 annual meeting : reports on amalgamation with Alberta Co-operative Wholesale Association – 1958-1959. The file consists of a report presented to the 1958 Farmers' Union of Alberta by President A. Platt; a memo to the UFA Co-op Board of Directors; and a resolution brought before the UFA Co-op annual meeting, November 1959. Affidavit concerning the estate of John Miller Gordon Stuart – 1951. The file consists of an affidavit with attached financial statement, concerning the estate of Stuart. He was a farmer at Milo, Alberta who died in 1920. He named the United Farmers of Alberta as the executor of his estate. The affidavit was sworn by Eileen Birch, Secretary of United Farmers of Alberta Co-operative. The file consists of a transcript of an FUA radio broadcast regarding automobile tariffs (Page 1 is missing); and a broadcast read by Eileen Birch discussing the Canadian Federation of Agriculture annual meeting held in Calgary in 1951. Radio talk by Leonard D. Nesbitt – 1958. The file consists of a transcript of a radio broadcast made by Leonard Nesbitt on Wheat Pool broadcast, describing UFA Co-op. The file consists of two editions of a prospectus for potential investors and members offering Series A Preference Shares in United Farmers of Alberta Co-operative Limited. Correspondence with Edmonton Co-operative Association – [ca. 1935]-1951. The file includes: proposed constitution of Edmonton Consumer's Co-operative Limited; Annual Report (1943); lists of members to who purchased Maple Leaf Petroleum products and amounts of their dividends and share equity (1943-1951); extracts from minutes of UFA Co-op concerning membership shares, etc. (1949-1950); correspondence concerning commissions paid to Edmonton District Farmers' Co-op as an agent of U.F.A. Central Co-op (1944). An organization called the Edmonton Consumer's Co-operative Ltd. started around 1935, but it is not known whether it became operational. The Edmonton District Farmers' Co-operative Ltd. was founded in 1938. It expanded rapidly and within a few years was dealing in farm supplies, feeds, groceries, general household goods, insurance services, and petroleum products (through a network of agencies in Edmonton and surrounding rural points). It was affiliated with U.F.A. Central Co-op and later with UFA Co-op for purposes of marketing Maple Leaf Petroleum products. It was also affiliated with Alberta Co-operative Wholesale Association. Sometime between 1947 and 1951 it was renamed Edmonton Co-operative Association. J.R. Love was its manager. Properties transferred from U.F.A. Central Co-op to United Farmers of Alberta Co-operative Ltd. – 1950. The file consists of a list of properties owned with clear title and under mortgage, listed by name of town with legal land descriptions. Minutes of meetings regarding the relationship of United Farmers of Alberta Co-operative with Alberta Co-operative Wholesale Association – 1947-1952. The file consists of a report of a meeting of the Executive bodies of U.F.A. Central Co-operative Association and Alberta Wholesale Co-operative Association (ACWA) to consider the possibility establishing a common wholesaling facility in Calgary (1947); memorandum of agreement between UFA Co-op and ACWA to allow tranfer of retail stores to ACWA (1950); minutes of a special meeting of Delegates of UFA Co-op to consider transfer of retail stores to ACWA (1951); minutes of a meeting of representatives of co-ops to consider re-financing of ACWA (1952). Saskatchewan Federated Co-operatives Limited re petroleum refinery – 1954. The file includes correspondence of W.J. Hoppins with H.L. Fowler of Saskatchewan Federated Co-operatives Ltd. and Henry Young of the Farmers' Union of Alberta; minutes of a meeting with the Management Committee of Saskatchewan Federated Co-operatives Ltd.; minutes of a meeting with Alberta Co-operative Wholesale Association. Correspondence with the Government of Alberta regarding wholesale and retail trading licenses – 1949-1955. The file contains correspondence of Acadia U.F.A. Co-operative Association regarding wholesale and retail licensing fees; and correspondence with the Department of Industries and Trade regarding contravention of the Wholesale Code by permitting sales to non-members. Correspondants include George E. Church, W.J. Hoppins, solicitor Alan Brownlee and Deputy Minister J.E. Oberholtzer. Correspondence regarding purchase of Maple Leaf Petroleum – 1957-1957. The file consists of correspondence regarding UFA Co-op's purchase of Maple Leaf Petroleum Ltd. from Imperial Oil, including proposed agreements and appraisal of the business. Correspondence regarding purchase of the name Maple Leaf Petroleum in file 54 of this series. Comparative statement of sales – 1940-1946. The file consists of records of petroleum products sales for each year, by Petroleum Agency. For 1945 and 1946 the data are broken down to indicate sales of light products (fuels), and lubricants and greases. The data were compiled by market analyst Kaichi Nishimura. Light product volume by agency – 1958-1986. The file consists of tables indicating quantities of "light product" (motor vehicle fuels) sold at each Petroleum Agency, in gallons (1958-1980) or litres (1981-1986). The file consists of information gathered to analyze the viability of various Petroleum Agencies. Includes worksheets containing data on sales volume, estimated market share, agricultural acreage in the district, sales volume of nearby Agencies, sales volume of local competitors; maps of districts; inventories of equipment and structures, with calculation of depreciation; photocopied photographs of agencies.Information was compiled for Agencies at Acadia Valley, Alix, Alliance, Athabasca, Barrhead, Buck Lake, Cereal, Coronation, Delia, Fawcett, Freedom, Granum, Hay Lakes, Hythe, Jarvie/Dapp, Lomond, Mannville, Milk River, Milo, Nobleford, Patricia, Pincher Creek, Radway, Rumsey, Westlock/Pickardville, and Wetaskiwin. Edmonton Farm Supply Centre pamphlet – . The file consists of a 4-page pamphlet entitled: News release : U..F.A. Co-op Farm Supply Centre, Edmonton : tribute to member support. Pamphlet announces the opening of the Edmonton Farm Supply Centre, includes photographs, narrative description, list of products sold, portraits of staff members. Iron Springs Petroleum Agency historic sketch and photos – [ca. 1940]-1999. The file contains a brief history of the R.W. Rogers Garage building, incorporated into the Prairie Tractor and Engine Society museum, an historical photograph of the building, and a portrait of R.W. Rogers. Detailed statement of gross margin – 1974. The file consists of a table indicating sales from each Farm Supply store or department, opening inventory on November 24, 1973, purchases, trade rebates, total eligible for sale, closing inventory on November 30, 1974, cost of sales, gross margin, margin percentage, margin factors, gross margin with factors, and margin percentages. Taber Farm Supply Store news clipping – 2003. The file consists of a news item announcing the appointment of Colin Howe as Assistant Manager of the Taber Farm Supply Store. Athabasca bulk fuel plant – 1960-1961. The file consists of correspondence regarding survey of land for a bulk fuel plant at Athabasca. Welcome to United Farmers of Alberta – . The file consists of a pamphlet providing a brief orientation to UFA Co-op for new employees. The file consists of a report on a statistical survey of UFA Co-op members, prepared by Corporate Planning, indicating member profiles and satisfaction. Farm Supply Division operating plan, 1988 to 1992 – [1987?]. The file consists of a document outlining the Farm Supply Division plan and strategies for the five-year period 1988-1992. 2003 annual meeting : UFA's history and structure – 2003. The file consists of PowerPoint lecture notes, prepared by Member Relations staff as orientation of UFA History for new UFA Delegates, presented on March 9, 2003. 2003 annual meeting : new delegate workshop – 2003. 2003 annual meeting : United Farmers Historical Society report – 2003. 2003 annual meeting : delegates' binder – 2003. Includes mission and vision statements; lists of delegates and staff members participating; portraits of delegates; outlines or PowerPoint printouts of reports by the Chairman, President, Chief Financial Officer, Chief Information Officer, Human Resources, Farm Supply operations, Petroleum operations, Member Relations, New Advisors Council, Delegate Information Committee, United Farmers Historical Society, and Grants and Donations Committee; resolutions; by-law amendments; list of Advisory Council spring meetings; report of Advisory Council survey on Sunday openings; report of Delegate Fall Workshop; and reports on delegates' activities. Service you can trust : internal service standards – . The file consists of a handbook of standards for cusotmer service and communications. UFA safety policy handbook : Farm Supply – . The file consists of a manual containing sections on: Safety Policy Statement, Safety and Health Committee, spill emergency procedures, fire/explosion emergency procedures, robbery emergency procedures, crisis communications, incident/accident/spill notification, first aid treatment & injury records, safety standards for external contractors, safety standards for Farm Supply stores. The manual is in a looseleaf binder for updating. Your benefits : UFA and you : a winning combination – . The file consists of a manual for new employees, containing information on employee benefits, in a looseleaf binder for updating. Belonged to Walter Egli. Camrose Petroleum Agency recruitment and announcement news clippings – [ca. 1990]-1998. The file consists of clippings of advertisements in Camrose newspapers recruiting a Petroleum Agent, and announcing the appointment of Randy Sroka, who took over the agency from retiring Blair Oliver; photographs of Blair Oliver and Petroleum Area Manager Bruce Maclean at the opening of the Camrose Cardlock; locally produced brochure advertising the Camrose Cardlock. Fort Saskatchewan Agency advertisement and correspondence – 1995-1997. Advertising flyer and newspaper advertisement for Customer Appreciation Barbecue at Fort Saskatchewan Petroleum Agency and Farm Supply Store; correspondence regarding Award of Excellence pin presented to Agency employee Greg Hamilton for outstanding customer service. Stony Plain Petroleum Agency closure correspondence – 1999. The file contains an incident report on the collapse of the Stony Plain Agency service station roof, photographs of the roof collapse, engineer's report, rationale for closure of the Agency, letter to member-customers, internal memo, notice of petroleum product seminar in Spruce Grove. Millet Petroleum Agency circular – 1994. 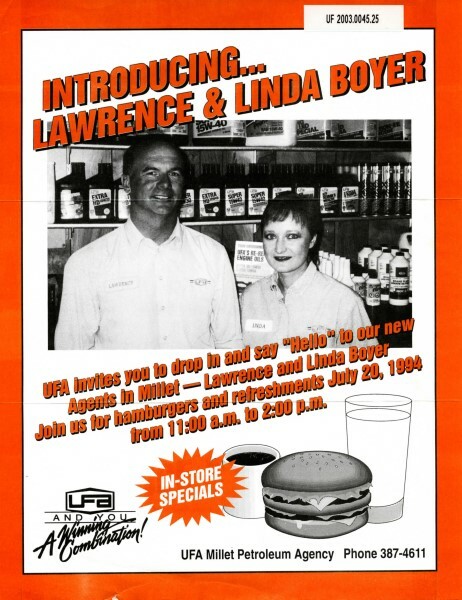 The file consists of a circular advertisement introducing new Petroleum Agents Lawrence and Linda Boyer and inviting customers to a promotional event. Thorsby Petroleum Agency correspondence and announcements – 1994-1999. The file contains reports on the fire at Thorsby Petroleum Agency (1994); biographical information form filled out by Petroleum Agent Wally Bensen (1996); newspaper ads and memoranda announcing the retirement of Wally and Barb Bensen and closure of the Agency (1999). Annual report – 1998 [i.e. 1999]. The file consists of: 1998 annual report. Includes financial highlights. Announcement of appointment of Geoff Southwood as President & CEO and his opening remarks to staff – 2001. Alberta petroleum market – 1948-1986. The file consists of tables indicating the annual volume of sales (in gallons or litres) of taxable fuels by all petroleum retailers in Alberta, and their percentage of the market (1948-1973). For 1959-1963 non-taxable (purple gas) products are calculated separately. For 1974-1986 sales are only compared for UFA Co-op and the rest of the market and are calculated monthly. For 1981-1983 shares of the Prairies purple gas market for all retailers are compared. For 1982-1986 shares of the Alberta purple gas market in dollars are compared. Board meeting minutes – 1952. The file contains minutes of the UFA Co-op Board meeting, April 7-8, 1952. The file was transferred from the Milt Ward fonds. Annual Meeting, Board, and Executive minutes – 1958. The file consists of minutes of the meetings of November 8-15, 1958.